Have you been hiding your smile because your teeth are discolored or you have a small gap or chipped tooth? The good news is that you don’t have to be a celebrity to have a glamorous smile. Porcelain veneers can not only transform your smile, they can transform the way you feel about yourself. Porcelain veneers are made of very thin shells of porcelain that are about the thickness of a fingernail. As a restorative material, porcelain can be artistically crafted to mimic the natural look, shape, translucency, and function of your tooth. Veneers hold up very well over time. In fact, they are actually harder than your tooth enamel and more stain resistant. Dental bonding is used to attach them directly to the teeth. And sometimes but not always, a very small part of your tooth enamel is shaved down slightly so the veneer fits seamlessly. This process makes them virtually undetectable. As shown in the image to the right, you can see the extreme thinness of the veneer, approximately 0.5 millimeter thick. This demonstrates how very little of your actual tooth is removed for a beautiful result. Not just any dentist can do porcelain veneers well. Most dentists are trained to fix things. A cosmetic dentist is passionate about creating beautiful smiles. And Dr. Collins truly takes pride in creating a beautiful smile that you will absolutely love. The first step in the application process is to arrive at a smile design. There are many factors that contribute to the overall look and feel of your smile like your face shape, how white you want your smile, and the exact shape of your teeth. The ultimate decision is up to you, but Dr. Collins will guide you through the process by having you look at photographs of other patients. We also have a book that will show you different shapes of teeth so you can determine the level of squareness or roundness you prefer. After you have selected your new smile design, Dr. Collins will create a wax model and a set of provisionals. After seeing this first glimpse, you will have an opportunity to make any changes that you see so they can be made to the model. Then, if you require any tooth preparation that will be done at this time. An impression will be made of your teeth and sent off to the laboratory where they will customize your new smile to be made to the exact specifications you have selected. The nice thing about the provisionals is that you can temporarily wear them home to get used to your new look. We offer a beautiful smile guarantee with all of our porcelain veneers. This means that you will have the opportunity to see what your smile will look like before it is permanently bonded in place to make sure that you absolutely love it. During this appointment, we encourage you to bring in your significant other along with you to offer an independent opinion. We will use a try-in paste to start with and give you some time to view them from every angle to make sure you are completely satisfied. If you see any changes that need to be made, we will send them back to the lab until they are perfect. To learn more about this, please visit our beautiful smile guarantee page. 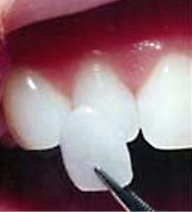 Once you give us the final go-ahead, we will permanently bond the veneers in place and shape them. Then, all that is left to do is to start smiling because it’s time to show off the smile of your dreams. If you’re unhappy with your smile in any way, porcelain veneers can do wonders. We offer a complimentary consultation where you can personally ask the dentist your questions to help you determine if a new smile design is right for you. Call us at 225-292-4321.